At the NRF command center on Planet Neutrino, Krang tells the resistance to surrender the Fugitoid to him within 24 hours or he’ll execute King Zenter and Queen Gizzla. Professor Honeycutt offers to give himself up, but Princess Trib wont’ let him. She says that they need to use what time they have left to complete their weapon to defeat Krang and defy the odds by rescuing her parents. Donatello goes with Honeycutt to the lab to work on the weapon while Leo and Commander Dask brainstorm on a rescue strategy. Back on Earth, Karai parachutes down to Burnow Island in the dead of night. Speaking of Burnow Island, April does some research and learns that it’s a small island between North America and Western Africa. It was taken over by a dictator named General Krang decades ago and the indigenous people killed off. Casey wonders why he never heard about that and April informs him that because the island has no natural resources or strategic value, no government or news program cared enough to report on the incident. As the plot thickens, April ponders just what Baxter Stockman is doing in a place like that. At the Royal Palace on Planet Neutrino, the King and Queen defiantly tell Krang that the Neutrino people will never submit to him. 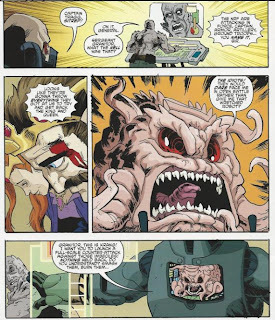 Krang informs them that he doesn’t want their submission, he wants their exterminations. And after he gets the Fugitoid, he will complete the Technodrome, terraform Earth into the new Utrominon and the Utroms shall rule the universe as they were always destined to. Krang tells Zenter that they aren’t so different, as they both want what is best for their people, however, what separates them is that Krang is ruthless enough to get what he wants. On Burnow Island, Karai kills a guard and puts her knife to another’s throat, demanding he take her to the alien ooze. Back on Neutrino, Honeycutt is reunited with his old lab partner, Felix (who now has a robotic arm after he lost his when Krang attacked). Felix and Honeycutt introduce Don to the END (Electronics Nullifying Device) Missile which, when completed, will use microwaves to disable all of Krang’s electronics and cripple his army. Honeycutt inquires how Felix finally tracked him down to Earth and Felix explains that after much effort he was able to track his unique radiation signature. And last but not least, before they complete the missile, Felix intends to fix Honeycutt’s damaged vocal circuits. Don can help. Later, Leo and Dask go over their strategy one more time. While Zak, Raph and the bulk of the NRF stage an all-out assault on the Royal Palace, Dask, Kala, Leo and Mike will infiltrate the complex and rescue the King and Queen. Pulling rank, Princess Trib insists on going too, much to Dask’s dismay (and Mikey’s delight). The Turtles and Neutrinos head out to battle while Don stays behind and helps Honeycutt and Felix finish the END Missile. And while working on said missile, Honeycutt tells Don that should they fail, Krang will have the Technodrome complete in two years. 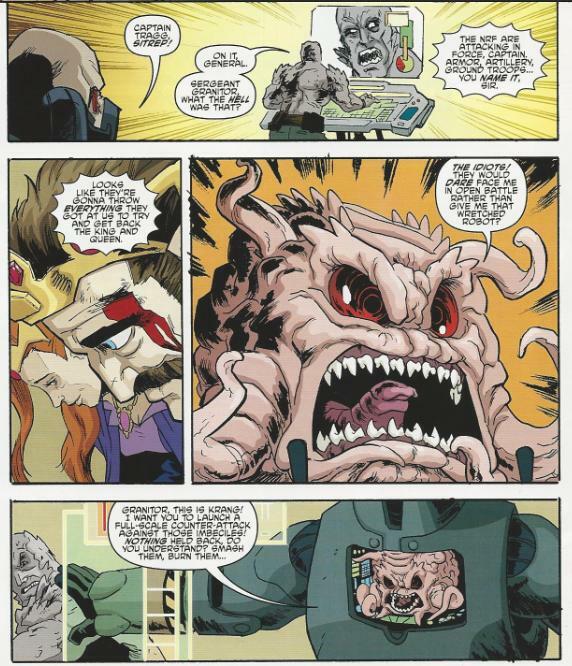 Honeycutt hints, though, that during his time as Chet, he allied himself with unsavory forces to plot against Krang. If they fail, those allies may be their only hope in stopping Krang. On Burnow Island, the guard leads Karai to the chamber where the Utroms are being held in ooze-filled pods as a form of stasis. Karai kills the guard then raises her sword, prepared to drain the pods of their life-sustaining ooze. At the Royal Palace, Zak and Raph have begun their assault. Inside, Krang and Captain Tragg are shocked by such a swift counter attack and order Sergeant Granitor to use their every military resource to stop the NRF. As the forces face off, Leo, Mike and the rest sneak into the Royal Palace and come face-to-face with Krang. 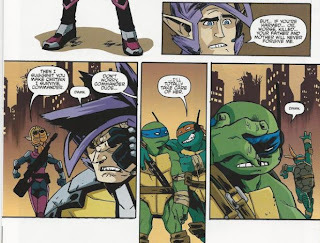 *This story is continued from TMNT (IDW) #18. 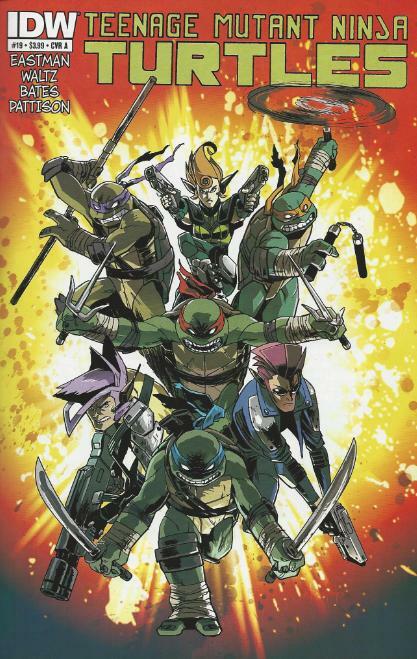 The story continues in TMNT (IDW) #20. *Honeycutt remarks with surprise that the Turtles kept the names “she” gave them. April named the Turtles way back in TMNT (IDW) #1 before they mutated. *Felix last appeared in TMNT Microseries #8: Fugitoid. 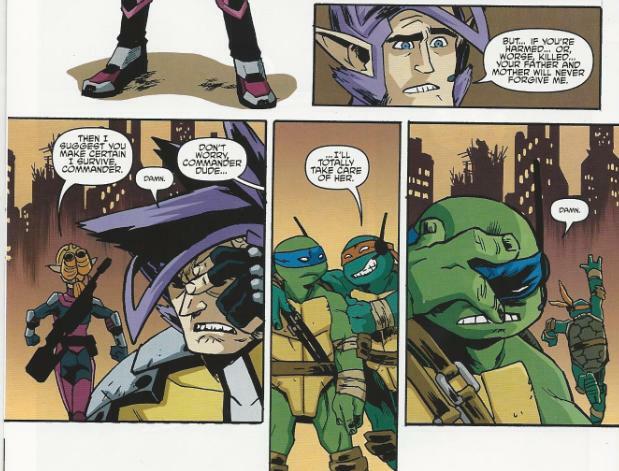 *Chet was shown working with the Foot Clan in TMNT (IDW)#10. *Among the Neutrino and Rock Soldier war machines you can spot Starmobiles, Flying Foot Skis, Turtle Blimp Gliders, Mutant Modules, Turtle Tanks and Sewer Dragsters (all, of course, were vehicles in the 1980s Playmates TMNT toyline). *This issue was originally published with 3 variant covers: Cover A by Bates, Cover B by Eastman and Pattison, and Cover RI by Nick Pitarra and Megan Wilson. Having to wait two months to get the next issue of TMNT sucked, but getting two issues of TMNT in one month rocked! I am conflicted. “Krang War” heats up as this issue primarily consists of getting all the players in place for the big finish. What I enjoyed most was seeing all the Neutrinos, who all shared a singular personality on the 80s cartoon, given more distinct characterization. Not *deep* characterization, but something’s better than nothing. A few of them even act as a counterpart to a particular Turtle, with Zak being the hothead (who immediately finds a soul-mate in Raph) and Dask being the no-nonsense leader that gets along well with Leo. Alas, Kala falls into the scenery during this issue and fails to receive any glimpse of a personality, but there’s still hope for next issue. Also, the way April is handling the disappearance of the Turtles here in IDW offers a great counter example to how she handled their disappearance in the Mirage series. When the Turtles were teleported across space in the Mirage book, April reacted by curling up in a fetal position and crying for three issues. Here, even though she knows she’s powerless to bring them back, she uses all her skill and resources to try and accomplish as much as she can in their absence; hunting for clues about Burnow Island and General Krang. It shows a useful, independent side of her that isn’t defined by her relationship to the TMNT. Even when they’re out of the picture, she stays sharp and keeps moving forward. Meanwhile, Mirage April was completely crippled once the Turtles were removed from her life because her entire existence revolved around them. Thank you, IDW, for this awesome, awesome April O’Neil. Those accomplishments aside, I found this installment in “Krang War” to be more of a drag than the previous episodes. I guess you could qualify it as “the calm before the storm”, but there was a lot of exposition and set-up huddled into this one issue that really weighs it down. We get exposition explaining Burnow Island, exposition explaining Honeycutt’s connection with the Foot, exposition explaining the magic missile (which is TOTALLY not an EMP weapon because that would be cliché), exposition about how Felix tracked down Honeycutt and a big long ramble as Leo and Dask explain what has to be the simplest strategy in the book (“You distract the bad guys while we slip in and rescue the hostages”). I felt like the issue was talking *at* me a little too much rather than trusting me to pick up on the plot elements on my own. Mikey’s crushing on Trib was cute and Krang going bonkers was wonderful (particularly for Bates’s art, but I’ll get to that), but some of the dialogue was a little… hammy. Krang whips out the old “We aren’t so different, you and I” villain standard, while Zak belts out a Tough Guy 101 “Who wants to live forever?” The dialogue was one “Stay frosty” away from reading like it was the output of an Action Movie Script Generator. Bates keeps on a-rockin’ the art and his animated touches just pep this comic right the hell up even when the script is a little sleepy. The cartoony effects, like Honeycutt whistling a note after getting his voice box repaired or Krang elastically erupting when the Neutrinos attack, aren’t the half of the charm, either. There are great little details to the staging, such as the cat-like look on Karai’s face as she lays in wait for the Burnow guards. 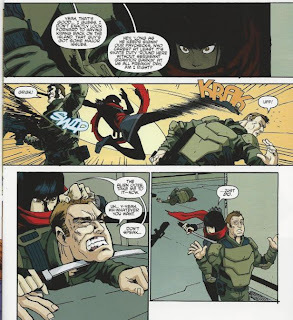 Bates’s Karai in general is my favorite rendition of the character from IDW and he really makes her look subtly formidable. And the way he renders the facial expressions on the Turtles really gives me a Stan Sakai vibe (they both draw the heads on the TMNT and their exaggerated expressions similarly). All in all, I enjoyed getting this issue so soon after the last one (delay and all) and I’m digging where the Krang War is going, but this penultimate chapter saved way too many details for next-to-last. Heh, I think ALL the Neutrino vehicles were inspired by classic Playmates Toys (blimp glider, Turtle Thank, Roadster, etc.). I'm having a little trouble identifying the toy inspirations for the Rock Soldiers vehicles (other than the obvious flying Foot Ski). Maybe the Ninja Grappler inspired their big tank? Ooh, I wish you'd included a scan of the shot of the vehicles; I'd love to see that stuff. Here's a scan for you! It doesn't have the Starmobiles in it, but it has everything else.